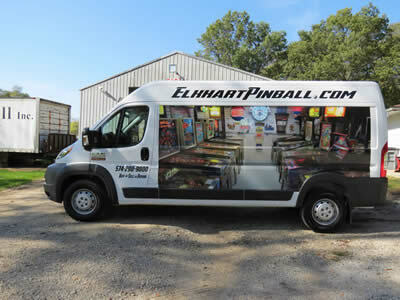 Elkhart Pinball Inc. 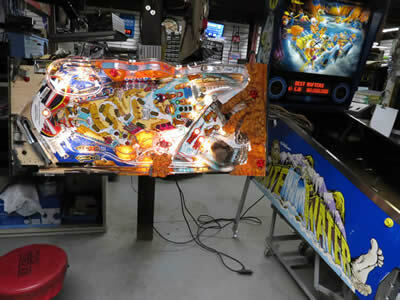 Since 2001, experience in repairing pinball machines since 1988. 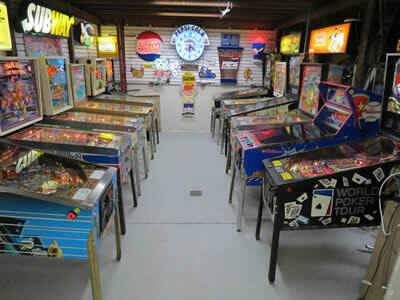 We are the leader in Northern Indiana and Southern Michigan in Pinball repair, sales, and service. Servicing the Northern Indiana, and Southern Michigan area. Buying, selling, repairing, and reconditioning. 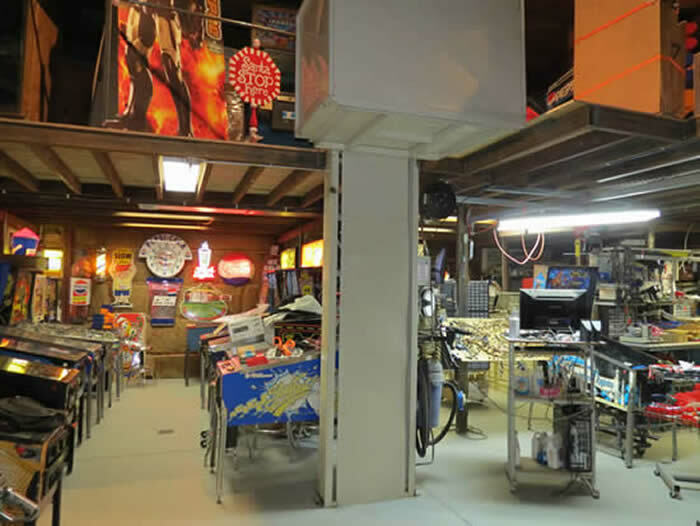 Over 80% of our business is service, Repairing and Reconditioning Coin Operated Pinball Machines for the public, both electronic (solid state) and electro-mechanical (EM). 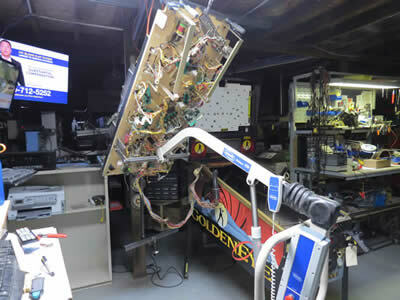 Repairs done in your home (50 mile radius of Elkhart Pinball INC.) or at our shop. 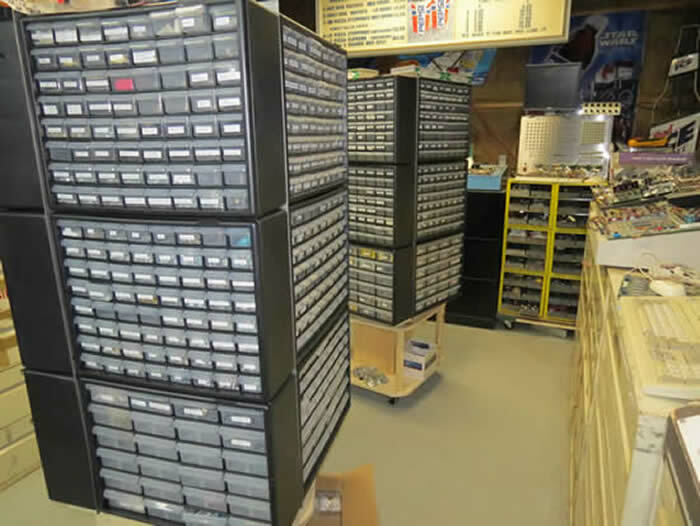 We have 11 different factory pinball board testers (we have all the Bally, all the Williams, Gottlieb System 3, Early Stern, Sega/Stern, and Alvin G & Co.) in our shop for repairing boards. When Elkhart Pinball Inc. sell’s a reconditioned pinball machine, we will post pictures of the playfield striped down, with all, or almost all the parts off, so you the buyer can see the condition of the bare playfield. Then we will show detailed pictures of the playfield put back together, so you the buyer can see how it looks all reconditioned. We have nothing to hide. When you buy a reconditioned pinball machine from Elkhart Pinball Inc. you are buying QUALITY. Not like some of the other Pinball Companies, or fly by night’s out there selling pinball machines on Craigslist or eBay, that claim their pinball machines are reconditioned, or refurbished. They will do what ever it takes to get them to run, and hurry up just to flip them to make a quick buck. They will only show a couple of pictures (and not very good ones), or even send you to a web page of somebody else's game to show what it looks like, or how it plays. Ask them for detailed pictures of what all they have done to the game, before and after. We have fix and repaired a lot of those eBay, and Craigslist NIGHTMARES over the years. A letter from the owner of this game. I purchased the machine out of state. After setup and initial play.....a fuse blew. It's my opinion the gamers of Northern Indiana are fortunate to have a dedicated craftsman to tend to our machines. It's been my experience John does his best weather or not he's being watched. That's the difference between a mechanic and a craftsman!!! I highly recommended him, if you have a question on your game, he'll give you an honest opinion on it's repair. All pinball machines sold are reconditioned or shopped. When we reconditioned a game, we use a very large ultrasonic cleaner, to clean all of the game parts. We also give a free 1 year phone tech support to all games sold. If you live within 50 miles of Elkhart In. it will comes with a 30 day warranty, free delivery and set up. (It is the buyer’s responsibility to move the pinball machine from the outside, and to the location of their choice), and then we will set it up, and get it ready for play. We no longer sell anything out side of the lower 48 states, due to shipping cost, customs compliance, fees and taxes.